I ate this at a fantastic Italian restaurant the other day. I must say it was the best Italian restaurant food I have EVER had. It was amazingly delicious. I savoured absolutely every mouthful. I couldn’t wait to try it myself at home. And I dare say that my attempt was pretty excellent too. The veal marrow from osso bucco really adds to the flavour so don’t be squeamish and remove it. Actually, at the restaurant I was served the marrow as a little breaded croquette. It was delicious, but personally, making a bloody croquette out of a piece of marrow is just way beyond my patience zone. Add the veal to a plastic bag then add the flour and a little salt & pepper. Jiggle the bag about to coat the veal. Heat a large pan with the oil and butter over a medium heat until bubbling. Add the veal and brown for 2 minutes on each side. Remove to a plate. Add the onion, celery and garlic to the pan with some more salt let this gently saute for 5-7 minutes until soft. Turn up the heat then pour in the wine and simmer for 1 minute. Slide the veal back into the pan with any juices and stir. Pour in the stock, bring to a boil then reduce the heat to slow and simmer gently for 1 1/2 – 2 hours stirring occasionally. The meat should be tender. Remove it from the pan. Take out the bay leaf then pour the sauce into a food processor. Blend until smooth. Return to the pan and reduce for a few minutes if necessary. With a fork, roughly shred the veal off the bone – scoop out any marrow and mash with the veal. Return the veal to the pan and stir in. Check for seasoning then cover. 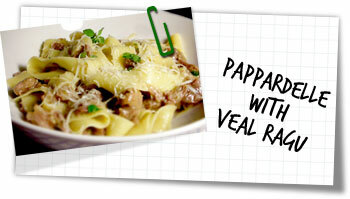 Heat a large pan full of water – when boiling add some salt then the pappardelle. Cook as per the packet instructions. When cooked; drain, return to the pan with the butter and stir well. Pour in all the ragu and stir well. Serve in bowls sprinkled with a little fresh marjoram alongside some crusty bread.